Infusion Therapy Institute is an education company providing hands-on IV infusion therapy training for nurses and allied healthcare professionals. Due to regulatory changes and innovations in the healthcare arena, infusion therapy procedures are now done in acute and alternate site care settings by licensed professionals and unlicensed assistive personnel. 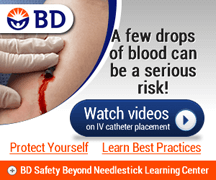 Professional schools provide little or no hands-on training vascular access and IV infusion therapy procedures. Scope of practice and regulations mandate additional IV therapy education, training and competency validations often referred as IV certification. 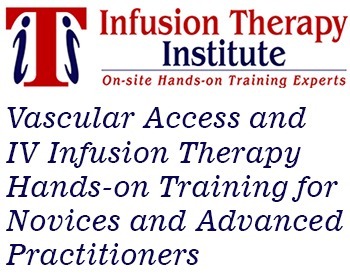 Infusion therapy experts who have recognized the needs for IV infusion therapy training edtablised the Infusion Therapy Institute (ITI). Our Mission is to collaborate with infusion therapy providers in all healthcare settings to promote current evidence-based infusion therapy practices and positive patient care outcomes through education and hand-on training. 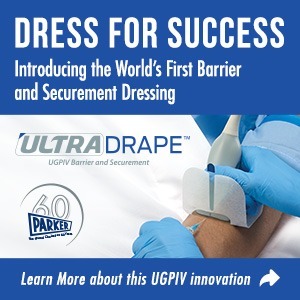 We envision empowering clinicians in all healthcare settings with the knowledge and skills required to perform vascular access and infusion therapy procedures safely with confidence. Our continuing education and IV training classes are developed according to the regulations, intravenous therapy standards of practice, and the center for disease control and prevention (CDC) guidelines for catheter related infection (CRBSI) prevention. We empower novices and advanced practitioners to perform vascular access and intravenous therapy procedures with confidence and competence. Upon successful completion of each training program, certificates of completion are provided to all attendees. Certificates of completion with continuing education (CE) contact hours are provided to all nurse attendees. CE contact hours are calculated as 60 minutes = 1 contact hour.